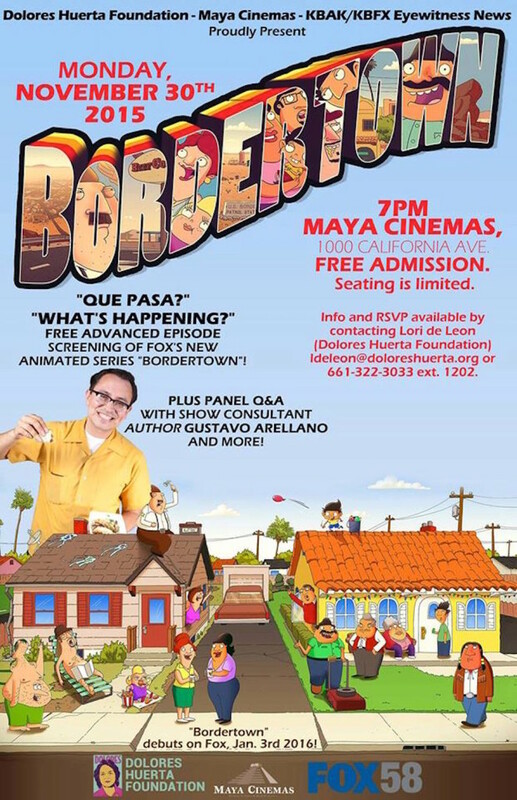 Seth MacFarlane’s newest comedy comes to Maya Cinemas, featuring show consultant Gustavo Arellano and a Q&A with a panel of local experts. General Admission: Free. Seating is limited. RSVP available by contacting Lori de Leon (Dolores Huerta Foundation) ldeleon@doloreshuerta.org or 661-322-3033 ext. 1202. The Dolores Huerta Foundation and Maya Cinemas in partnership with KBAK/KBFX Eyewitness News will host an advanced screening of a full episode of “Bordertown,” a new FOX TV animated series that centers around two families living in a Southwest desert town on the U.S. – Mexico border. The show is produced by Seth MacFarlane of “Family Guy” and “American Dad!” fame. “Bordertown” has set out to stir the pot of the U.S.’s supposedly enlightened race relations like no other show has in a generation. The show’s topical border humor has become increasingly relevant in light of recent political developments. The screening also will feature a Q&A panel discussion with OC Weekly editor and author, Gustavo Arellano, who worked as a consultant on the show. Local panelists include: entertainment writer and musician Matt Munoz (The Bakersfield Californian / Mento Buru), Chelsea Esquibias (Latina Leaders of Kern County), Cornelio “Corny” Rodriguez (Bakersfield College), cartoonist Erwin Ledford (The Plainest Plane). Panel moderator: Miranda Whitworth. “Bordertown” will debut on Jan. 3, 2016 on FOX. #### For more information and interview requests, please contact Matt Munoz 661-472-3865 / mattomunoz@gmail.com.